These sculptures were modeled after late 19th to early 20th century Thai models. The two poly-chromed teak figures stand at approximately 8' high. The University acquired the sculptures as a gift in 1946 from Robert Allerton. They are displayed in the House of the Gold Buddhas at Allerton Park. Amazingly, these two slim, delicate images of Buddha were fashioned from single logs of teakwood. Students of the Royal School in Bangkok, Thailand, made them from prototypes Allerton selected in nearby wats (Buddhist monasteries or temples), waiting for two years for the wood to season properly before embarking on the project. 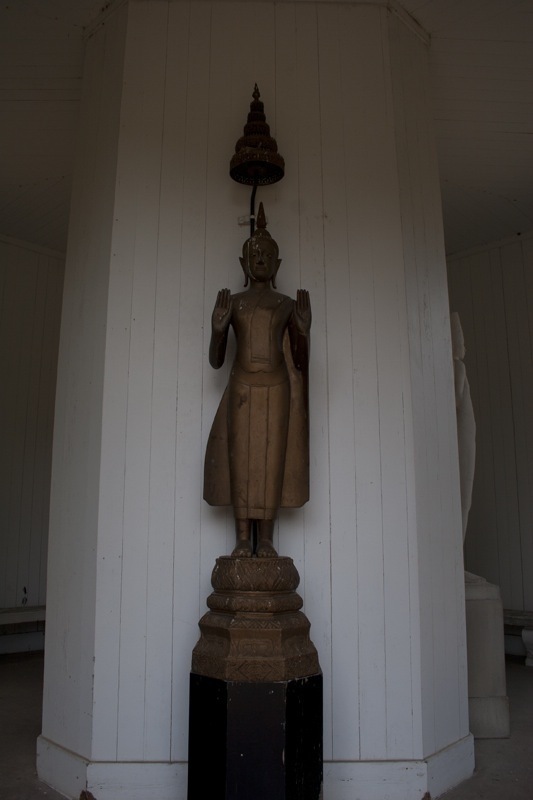 Standing solemnly under multi-tiered parasols of brass like those traditionally part of a Thai crown prince's regalia, the figures are attired in customary monastic garb, the 'uttarasanga', a simple clinging, draped cloth reaching almost to the ankles. Because Thai religious iconography attaches exceptional importance to stance and gesture, the Buddha with arms bent up at the elbows and both palms turned out toward the spectator signifies "calming the waters" and is meant to dispel fear and give protection. The other Buddha, his right arm placed diagonally across the chest to his opposite shoulder and his left hand holding up his garment, is in a pose not specified in any of the standard sources for Buddhist imagery. The figures' firm, upright, frontal attitude conforms to the requisite "feet with level tread" in Buddhist Sanskrit and Pali canonical texts. Other conventional signs identifying the Buddha include long fingers and toes, a complexion the color of gold, delicately smooth skin, a divinely straight frame, blue-black hair in little curling rings, intensely blue eyes (the original mother-of-pearl is intact here}, and a head like a royal turban-all particulars met in both Allerton statues. Gently curved shapes and plain costumes contrast with decorative, linear patterned bases and lacy, filigreed parasol bands. Headdresses are elaborate too, consisting of arrangements of small, tight haircurls extending into mounds forming what is known as the 'ushnisha', surmounted in turn by flame finials called the rasmi. The characteristic spiraling ringlets allude to the legend of the grateful snails that formed a helmet over Buddha's skull to protect him against the sun's burning rays. The cranial protuberance conventionally signifies "a bump of wisdom on top of the head." The flame-shaped ornament emanating as a ray of light symbolizes Buddha's power and glory. Lastly, the elongated earlobes, split and distended in a custom still practiced in southern India, denotes Buddha's rejection of royal ornaments. 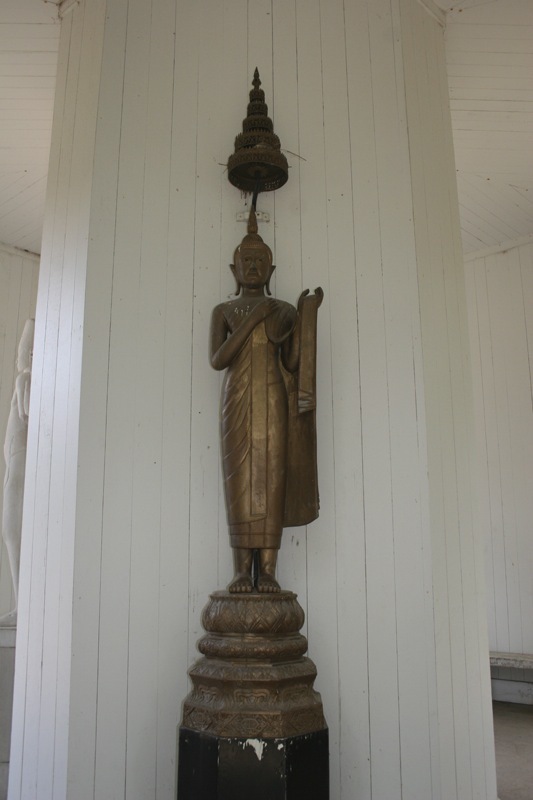 These sculptures are displayed in the House of the Gold Buddhas at Allerton Park. Muriel Scheinman, “Siamese Buddhas, ca. 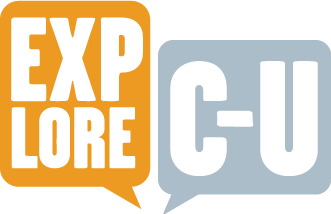 1930-1931,” ExploreCU, accessed April 19, 2019, https://explorecu.org/items/show/59.